Jamie Hebner attended Grand Valley State University to receive a Master of Science in Physical Therapy. She focused on sports medicine the first 5 years of practice and is currently McKenzie certified. 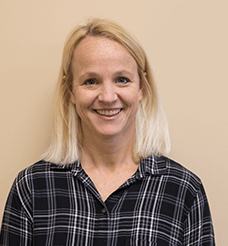 Jamie has been practicing as a licensed Physical Therapist for 16 years. In her free time, Jamie enjoys personal fitness/nutrition, spending time with her husband and 4 kids, camping and playing sports.